Let's start with a big claim: I believe that the 18-year property cycle is the most powerful concept you can know about as a property investor. That there’s a reason why property prices always go up in the long run – giving you more confidence that they will continue to do so. That they won’t go up in a nice smooth, straight line: crashes along the way are inevitable because of the way the system is set up. That you can ignore what the newspapers say about property prices, and have a far better understanding of what’s likely to happen next by looking for certain signals in the world around you. In short, a lot of facets of property investment that seem random or uncertain will suddenly make a lot more sense. With this knowledge you can at least avoid making the wrong move at the wrong time that would put your portfolio in jeopardy – and at most, you can make it a central pillar of your investment strategy. You could just take my word for it when I say that property is cyclical – but you won't be convinced enough to take action based on it until you've fully grasped the logic for yourself. It's sometimes easier to understand this concept visually. Property Hub University has a free video course on the 18-year property cycle that's well worth checking out. Why is there a property cycle? In pretty much every market other than land – whether it’s goods like cars, or labour like hairdressers – the forces of supply and demand keep prices roughly in balance. If we all become more vain and start having our hair cut every day, it will be impossible to get an appointment and hairdressers will raise their prices to profit from those desperate enough to pay more for their coiffure. Soon, these higher prices will attract new hairdressers into the market, and the extra supply will mean that everyone has to reduce their prices to remain competitive. I’m not sure I’d want to have my hair cut by someone who’d only just entered the market because they saw how much money they could make, but that’s by the by: the point is that supply and demand work in tandem to keep prices stable over time. As a result, when the economy is growing and there’s demand for new homes, shops and factories, that extra demand will push prices up. And because there’s no supply mechanism to pull prices back down, land prices increase faster than wages and the price of goods. It doesn’t take people long to realise what’s happening and see that they’ll get the best return on their money if they put it into property (as a proxy for land). At times of particularly high demand, people “speculate” by buying property on the assumption that the price will continue to go up. Because property prices increase faster than wages do, property eventually becomes unaffordable for the majority of people. When this happens, the bust comes: property prices plummet, causing chaos for the banks (which have been lending money secured against high-priced property). The banks withdraw lending, building activity stops, and businesses shut down – which all have obvious knock-on effects for stock markets and employment levels. Eventually of course, prices drop to a more sustainable level and everything gradually goes back to normal – at which point the whole cycle starts again. Importantly, each cycle starts from a higher “bottom” than the previous one – so the long-term trend is always upwards, even though there’s a lot of volatility along the way. That, in a nutshell, is the property cycle. It would be more accurate to call it “the land cycle”, because the cost of building a house on a piece of land is much the same in London as it is in Leeds, and won’t cost more in 100 years (other than inflation) than it does today. But house prices are more accessible to us than land prices, so we can “read” property prices to tell us what’s happening in the land market – and therefore what’s ahead for the wider economy. The economist Fred Harrison was one of the first people to identify the existence of the property cycle. He traced it back for hundreds of years to conclude that the length of a full cycle averages out to 18 years, with each cycle divided into distinct stages. Chances are you'll have a memory of at least one complete property cycle – possibly more. As we talk about the indicators that signify each stage, you’ll probably be able to think back to the clues that were there, in retrospect, in cycles you’ve experienced in the past. This is critical because if you don’t look for your own evidence, the media will lead you astray. After all, in 2006 did you see more headlines saying “Quick – you’ve got a year or two to sell everything!” or “How to get the best rates on 110% mortgages”? As we’ll see, at every stage, the professionals who are watching the signals act very differently from the amateurs who are watching the media – and they get far better results. We’ll start as prices have bottomed out at the end of the recession, and the recovery phase is just beginning to get underway. Prices have fallen far enough to tempt the bravest investors back into the market, attracted by the high yields that are on offer as a result of prices falling while rents stay pretty much the same. (Rents don’t fall because everyone still needs somewhere to live. Even if renters were brave enough to take advantage of the lower prices and buy, this is the toughest point in the cycle at which to get a mortgage because banks are struggling too. )These brave investors are what we can think of as the “smart money”: contrarian investors who’ve spotted the opportunity to get in at rock bottom, and are willing to take the risk of buying up assets while confidence is low and the investment case is still unproven. Of course, nobody knows precisely at what point the bottom of the market has been reached. Smart investors are just willing to take an educated guess, based on the knowledge that their upside potential is greater than their downside risk.Meanwhile, amateur investors are totally absent from the market – even though lower prices and lack of competition mean that it’s precisely the best time to buy. They might even crystallise their losses by selling at the bottom of the cycle “before prices fall any further”, or be forced to sell because their portfolio was poorly structured to weather a recession.So, if there’s pessimism all around you and the media is full of doom and gloom even though the major catastrophic events of the recession seem to be over, the recovery phase might just be getting underway. 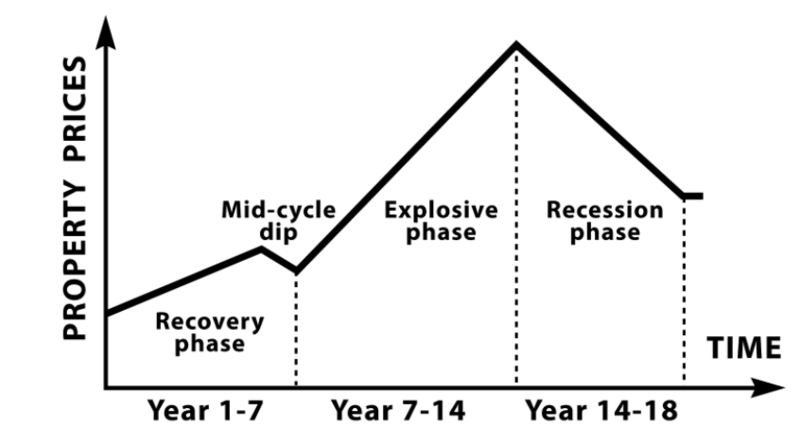 As the recovery phase develops, more buyers will have the confidence to enter the market – having the effect of pushing prices gradually upwards.Look out for big companies and pension funds starting to buy up distressed portfolios: they have the market intelligence to get in early but can’t take the risk of getting in too early, so it’s a good signal of the recovery solidifying. The prime assets will always be the most attractive, so this early growth tends to begin in the centres of the most economically powerful cities and “ripple out” from there. Perhaps following a slight mid-cycle dip as the earliest movers take their profits, the recovery phase will give way to the explosive phase.It’s now clear that prices are on the up, and the banks will be over the shock and willing to start lending again. That supplies enough confidence and capital for major building projects to start again, so expect to see more cranes on the skyline.House prices will begin to increase markedly faster than wages, and it’s at this point that the media gets interested – you’ll probably start to see headlines along the lines of “House prices increasing by £200 a day” and “My house earned more than I did last month”.Fuelled by this, people start to speculate: they either “move up the ladder” to somewhere bigger before it gets even further out of their reach, or they increase the mortgage against their home to fund holidays and cars. Banks make it easy for them to do so, because everything’s in full swing and they just want to lend as much as they can.At some point, logic and fundamentals go out the window and group psychology kicks in. The higher prices go, the more everyone assumes that prices will keep going up – so they buy at any level, pushing prices even further. The smart investors who got in early will be quietly selling off their holdings to lock in their profits, but the mania is such that nobody will notice.As we move towards the peak of the explosive phase, it’s a seller’s market, and sellers know it – so estate agents conduct “open house”-style block viewings to stoke demand even further. Even properties that wouldn’t have excited anyone a few years earlier end up going to sealed bids. Properties routinely sell for well above their asking price, and developers start marketing ever more “off plan” properties to capitalise on the demand.Banks aren’t immune to the mania, so they loosen their lending criteria to grab a bigger piece of the action. Even if some individuals within the banks are aware that the boom is unsustainable, they’re still under pressure to compete with everyone else: shareholders won’t be happy with them sitting back and not lending while everyone else is so optimistic.This lax credit keeps the party going for longer than anyone would previously have expected. At some point, a commentator or economist will predict that everything’s about to come crashing down because everything is so fundamentally overvalued – but a year later prices will still be rising, and that commentator will be branded a “doom-monger”. The final couple of years of the explosive phase, as prices and mania reach their peak, are what Fred Harrison branded the “winner’s curse” phase. Why is it a curse to be a “winner” by placing the highest bid for a property during this time? Because the next recession isn’t far away, and it won’t be long before the asset you’ve bought will be worth markedly less.You obviously can’t know when the “final years” of the upswing are until they’ve already happened and it’s too late, but there’s no shortage of warning signs that we may be near the top if you know where to look.One such sign is the announcement of overblown building projects like “world’s tallest building”, “Europe’s largest shopping centre”, and other sorts of over-ambitious ideas. These projects are conceived at a time of supreme confidence and funded in a permissive lending environment. It’s often the case that the bust has already happened by the time they’re completed, and they sit mostly empty – a monument to the delusion that has just passed.Another surefire sign is the rationalising of the ridiculously high prices that the mania has brought about. Justifications will be found for why “things are different this time” and we’re in for an era of permanently higher prices… yet at some point reality will set in, and the recession phase is imminent. Because the market was being driven by sentiment rather than fundamentals in the frothiest years, it’s easy for confidence to suddenly evaporate and take the market with it. Prices plummet, and people who are over-leveraged go bankrupt – triggering waves of forced selling, which pushes prices down even further.It’s impossible to pinpoint the exact moment when this is going to happen, but you won’t need to be told when it does: nothing sells newspapers like bad news, so the media will stoke the panic with endless horror stories.The recession phase seems like it will last forever, but it never does: at some point the smart money will be tempted back in, and the whole thing can start all over again. How can we profit from the property cycle? So we've learnt that property is cyclical, and looked at the four stages it goes through during each cycle. All very interesting, but how can we use this to invest more successfully? Let’s start with an implication that sounds mundane but is actually very important: property is cyclical, therefore prices surging and falling back are nothing to be overly concerned about. If you only listen to what the media says, the message is always “everything’s great!” or “everything’s terrible!” – and it can seem totally random as to which is the case at any given time. It’s reassuring to know that it’s not random at all, and it’s driven by fundamental economic principles. The next implication is that if the cycle moves predictably through its four stages, you can see what’s coming next. Even if you don’t know precisely when something is coming, knowing that it will come makes a big difference. For example, you’re less likely to panic and sell at the bottom of the market if you know that prices won’t fall forever – they will inevitably recover. Fred Harrison claims evidence going back hundreds of years for the cycle’s duration averaging 18 years, but I prefer not to dwell on the exact timing. 18 years is an average, so could easily be off by a few years in either direction. Getting hung up on the exact duration of the cycle is a distraction. Just the fact that there is a predictable cycle (of any duration) is the point, and you can see the stages progressing even if you don't know how many years have passed. You can gauge where we are now (and therefore what’s coming next) by looking at signals out there in the world. For example, are you seeing more and more cranes as you walk around town, and prices seem to be taking a bit of a dip after a few years of slow and steady growth? Then you could surmise that we’re well into the recovery phase, and you can strap yourself in the explosive phase yet to come. We’ve also seen that the “smart money” and the amateur investor behave differently from each other throughout the cycle. For example, just as casual investors are lining up a huge mortgage to grab their piece of the boom, those in the know are quietly selling their stock and stockpiling cash for the crash to come. In other words, most people buy high and sell low – exactly the opposite of what they should be doing. I can’t promise that knowing about the cycle will give you the degree of knowledge and mental toughness you need to buy at rock bottom and sell at the very height of the market. And nor do you need to – remember, each cycle starts at a higher level than the previous one, so “buy and hold for 20 years” is still a perfectly valid strategy. What’s more, if you sit around for years waiting for prices to fall, you’re missing out on a lot of income. Don’t panic and sell a property just because prices are falling. Thanks to the cycle, you know that prices won’t go to zero and it won’t be that long (in the great scheme of things) until they’re back beyond where they were. Don’t put yourself in a position where you’re forced to sell at the wrong point in the cycle. This means not over-leveraging at the peak, and making sure your portfolio can withstand temporary falls in value. Don’t get carried away (like everyone else is) during the winner’s curse phase. This is the worst possible time to buy a property, because prices will soon fall and won’t recover to the level you bought at until relatively late in the next cycle. It’s an even worse time to remortgage and use the cash for fancy cars and holidays. You might think you’d never be so daft, but plenty of people were last time around. Don’t get mislead by the media. As we’ve already seen, the messages they pump out around the key turning points of the cycle are almost exactly the opposite of what professional investors are doing. Putting on the blinkers and shutting it all out is easier said than done, but it’s vital for making the right decision. Be a buyer when everyone else is selling. It doesn’t even have to be at rock bottom: people’s memories of a crash last longer than the economic reality, so the estate agents’ offices remain empty well after prices have stabilised and started to creep upwards again. Stockpile your cash during the winner's curse phase, so you're prepared to swoop when everyone else is selling. Mortgage lending will immediately tighten when prices take a tumble, so even if you’re brave enough to buy you might not be able to access the funds. Instead, you can raise funds in advance by selling poorly performing properties or refinancing (to sensible levels) properties you’ve already got. Hang on, didn’t I just say that remortgaging in the winner’s curse phase was a terrible idea? No, only if you’re using the equity you release to buy overpriced properties or fund your lifestyle. If you put the cash in the bank, you can use it later to buy properties at a discount – or just repay the money if you change your mind. So, I hope by now you’re a believer in the wonders of the property cycle. You don’t have to scrap “buy and hold” and start timing the market instead – although you can if you want to. Even if you just stick to the very basics, you’ll do very nicely indeed. The main takeaway is that a crash is inevitable: at some point during your time as a property investor, prices will fall – and do so quickly. In my book, The Complete Guide To Property Investment, I dedicate a whole chapter to how to survive a property crash. Click here to buy it on Amazon.